Can’t believe it. 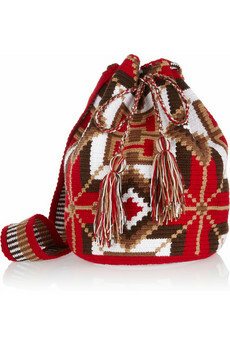 A Wayúu bag on net-a-porter?!!? I must develop some business opportunity real quick! The bag that is featured on net-a-porter, the leading luxurious fashion online retailer based in the UK, is made by the largest of the 80-100 ethnic groups, Wayúu, in Colombia. They make good quality and durable bags that are colourful and reflect their happy outlook of life. Looks like the Wayuu Taya foundation is doing very well to get Colombia out to the world! It seems that Colombia is the talk of the town. It has recently been selected to be one of the top tourist destinations in 2013 along with New Zealand and Ireland (why?!) and it is one of Christine Largarde‘s chosen country for the 5-day Latin American tour this week! I know this because I bumped into her as I entered the biggest handicrafts fair in Colombia that happens every year on Monday! With the combination of silver locks and super tan skin, she was unmissable. The only new thing I learned was that she is really tall and used to be on the synchronized swimmer French national team! yes! the bags are just like the girls – very colourful! funny? a friend of mine just went back to oregon after 9 months in colombia & he says…girls here(in OR) are so ugly!!! tell me what you got from the lyrics.